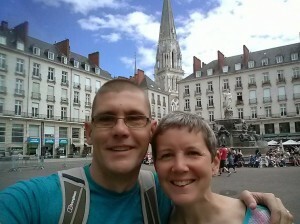 Home to Nantes 0-187 miles – Do your dream! After a lovely send off by some of the neighbours we headed for the train at Trowbridge station. We expected the train to Portsmouth to be stress free but it was far from it. Our bikes didn’t fit into the pre booked bike area and apart from that 4 other cyclists joined which made the bike area a nightmare. That is excluding the hasssle from people sitting in the doorway reluctant to move and people wanting to use the bike area as luggage storage argh! Still we made the ferry in plenty of time and got our cabin with no hassles. Unlike last time when everyone (Mel included) recycled their tea, this was smooth as anything and no problems and even some sleep. Coming out of St malo was easier than expected and traffic on our route was light. We did no more that 15 miles on roads and even then the roads were quieter than typical UK roads so all was good. Coffee and lunch breaks were in lovely locations with a few spots noted for future campervan hideaways. The first day saw the end of Mels delicious home made flapjacks as well as some other goodies but the route was quite undulating. 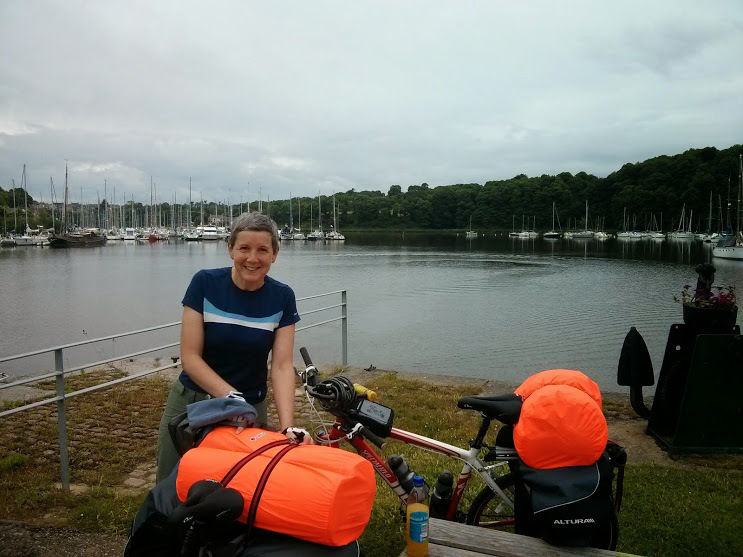 We made okay progress and did longer than hoped with bikes reporting 41 miles to Tintainac where an okay campsite was only €6. Bargain. A local super U supplied the wine which went down rather quickly! On dear we may be a couple of winos when we get back! Still a good nights sleep followed quite quickly! Overnight it started raining and really dumped down. Joys of camping. So we had to pack up the tent in the rain and make headway to our second stop which we knew was quite a way. In fairness the rain stopped quickly so we didn’t get soaked but the paths were flooded and muddy which made it very tough going. The compacted sand was more like quicksand and it really showed us down and caused extra work. The bikes hated it too as the sandy water was like grinding paste and you could almost feel some parts wearing out. Rennes was a bit busy to get through and not the most picturesque parts but there were some pretty hidden sights on the way. 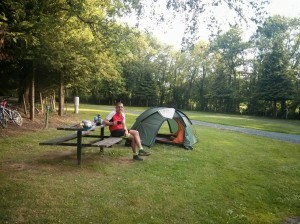 We made our second night okay in borg-des-comptes after a tough 51 miles and arrived in glorious sunshine giving us good chance to dry things out and cheekily wash the bikes. Day three saw pretty much perfect biking weather sunny but not to hot and little wind. 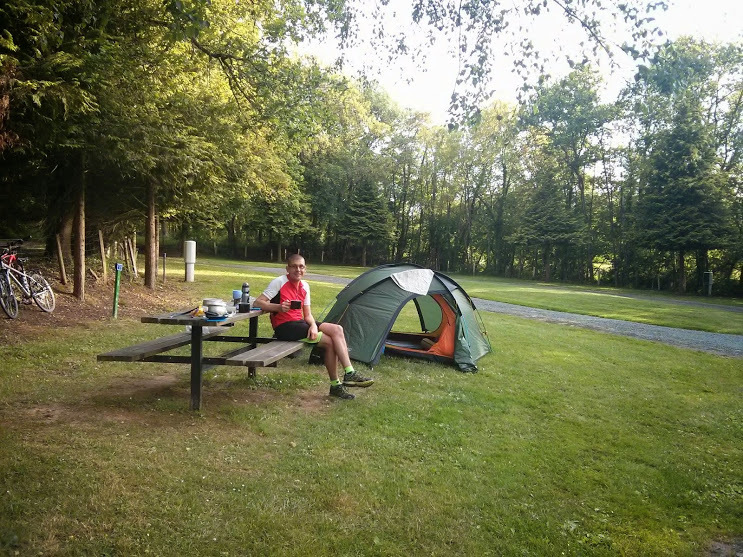 Our bums weren’t as bad as expected so we managed 42 miles to our camping spot just south of Redon for €6. However after the grit of the previous day the damage to the bikes was apparent with one of the pedals ceasing up. Freed with some wd40 but clearly the bearings were shot. Good old osmand maps as it showed us a decathlon store enroute for some replacement pedals kindly fitted by one of the staff who promptly took the skin off the top of his knuckles. Nothing too exciting to report enroute apart from some lovely cakes at the boulangerie. After over 130 miles in 3 days we are a bit tired and quite surprised we’d got as far as we had! With tired legs we thought we’d have an easy day 4 but in the end did an epic 55 miles to get all the way to Nantes so we could have a rest day. The route was nice enough and mostly good going with the only challenge being broken chain! Obviously making a bit to much effort up a hill! Fortunately after advice from a friend (thanks Chris) I had a chain tool and some spare links and hence no problem. Bit annoying as I put new chains on before we left but the link that failed was at the end. So maybe I damaged it when shortening the new chain. Who knows. But a potential disaster avoided. 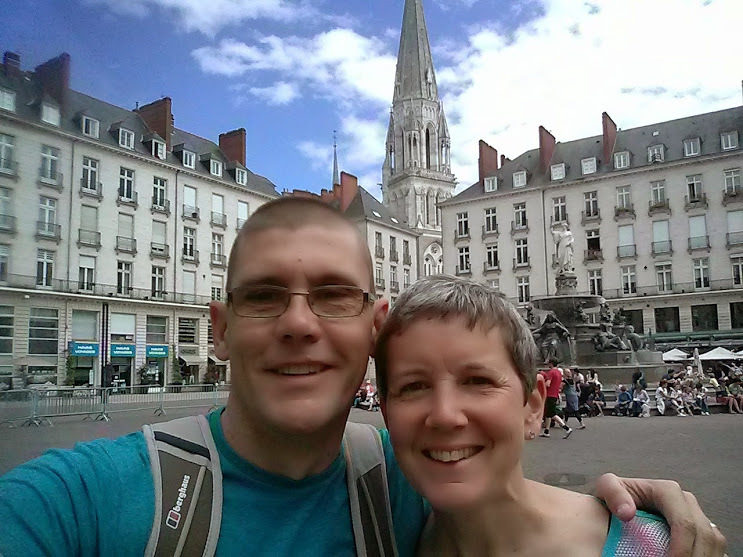 Learned another lesson too – if the map looks like a long way round is for a reason… As we found out trying to take a short cut into Nantes and finding it hilly. Quite annoying after 50 miles! 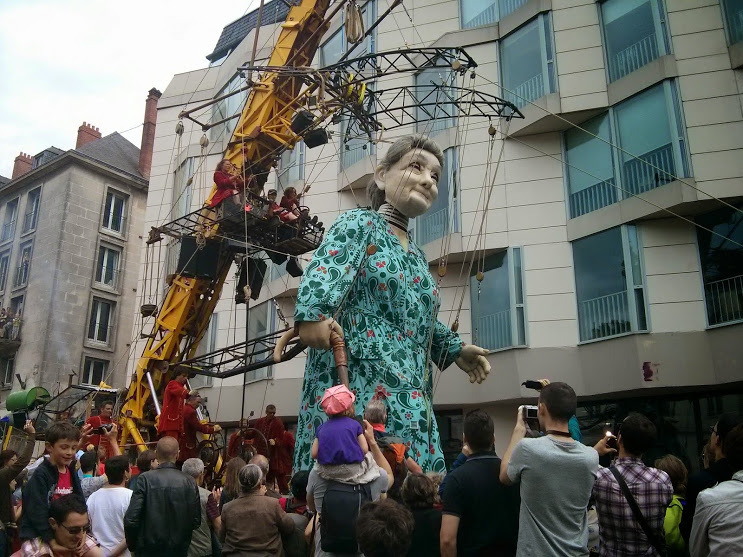 Still a day off exploring Nantes and, apparently, a festival of giants… The campsite at Nantes is rather good with excellent facilitates but as it’s a bank holiday weekend it is full of kids and our neighbours are noisy. Convenient for the city due to a tram outside. 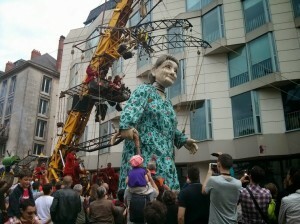 The city was very busy with massive crowds with what turned out to be a single giant which was an old lady lying down to get under the team lines. But low and behold like a giant puppet it came to life, got up and started walking by a team on guys and ropes. Very impressive indeed. There did seem to be more going on with evening party but with a long ride in the morning we are having an early night. Lessons so far…. Gravity gives speed but just as easily takes it away and makes you pay with interest. Sand canal paths are awful to ride on especially when wet. And if you keep pedalling you will get there… The most suffering though is from sodding hay fever!!!! Itchy and swollen eyes and runny nose and that is with double dosing pills! Still 187 miles done…. Only around 800 to go….